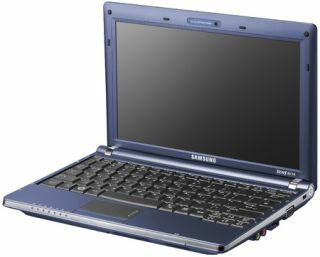 Samsung is the latest in a long line of computer manufacturers, which has decided to branch out in the increasingly popular, and overcrowded, netbook sector. TechRadar had been expecting this news since May, as the company had let slip it was thinking about going into this cheap-and-cheerful computer market. The NC10 has been given a matt finish, a 10-inch 1024 x 600 display and a choice of quite substantial hard drives – 80GB, 120GB or 160GB. Memory-wise, you are looking at 1GB of 533MHz DDR 2 memory, which should be plenty to run the Linux OS or Windows XP. Which is pretty powerful, considering it's aimed at web surfers. The netbook comes in three colours: fetching blue, black and silver, and houses all the ports you have come to expect from a netbook: 802.11b/g Wi-Fi, Bluetooth 2.0+EDR, 10/100Mb/s Ethernet, 3-in-one memory card reader, audio sockets, VGA port, 1.3MP webcam and three USB ports. Due in October, the NC10 will cost around £329.